So, you’ve got your rod, you’ve got your hook, you’ve got your bait, you’re out on the water, and, oh, wait, you’ve got a bite! But you’re not just reeling in your catch at your leisure—the fish will fight back, and you must be prepared for when he does. Successfully fighting and landing your fish takes a bit of strategy, and practice. Here are a few tips to keep in mind! Hold steady with your fishing rod! 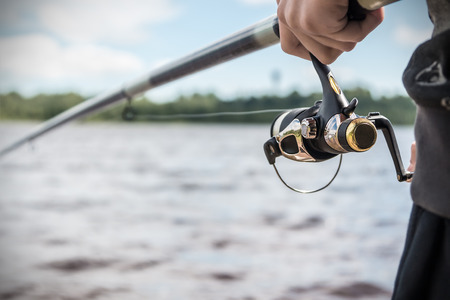 This is one of the most common mistakes a first-time fisherman makes: losing control of the rod, and as a result, either losing the fish, or the rod itself (which you don’t want to let happen!). So, the moment you start reeling in, hold both hands on the rod firmly, and make sure you stay in a central position. By letting either waiver, you become vulnerable, providing your catch with the perfect opportunity to get away. Another mistake we often make is that we think, “Ah, the fish! Reel it in! Hurry!” But that’s actually the opposite of what you want to do. Instead, reel in calmly; let your rod drag a bit—that’s what it’s meant to do. If you reel in too fast, you run a greater risk of losing the fish. So, you held steady, took your time, and now your fish is almost landed. If the fish is a significant amount of weight—and you should know just by feeling the rod and drag—then be sure to use a dipnet. If you don’t, there’s a chance that your rod could be damaged by the landing, since it requires a bigger push. Give your rod a break and use the dipnet. With these tips in mind, you’ll be well on your way to fighting and landing your catch, and when you come aboard the Triple Trouble, you’ll have a full crew ready to help with the fight! Give Capt. Chad a call at 256-431-5767 or email the captain today to learn more about booking a charter trip!